On Myoutdoorkitchen.co.uk we offer everything including traditional, modern and built-in outdoor kitchens. Among our brands you will find Steel, who specialize in outdoor kitchens. A smaller, top-of-the-range, free-standing outdoor kitchen. The Oklahoma is ideal if you’re looking for something innovative and stylish. This outdoor kitchen with its black finish has everything you need for alfresco cooking. A free-standing gas grill with infrared heating and six burners, a side burner, a refrigerator and sink module, and plenty of storage space. 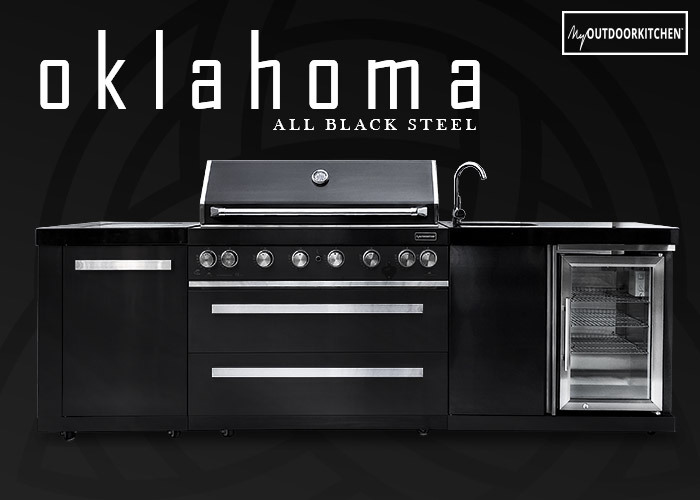 “The Oklahoma” gives you the perfect combo with black 304 SS steel and a luxury marble worktop. 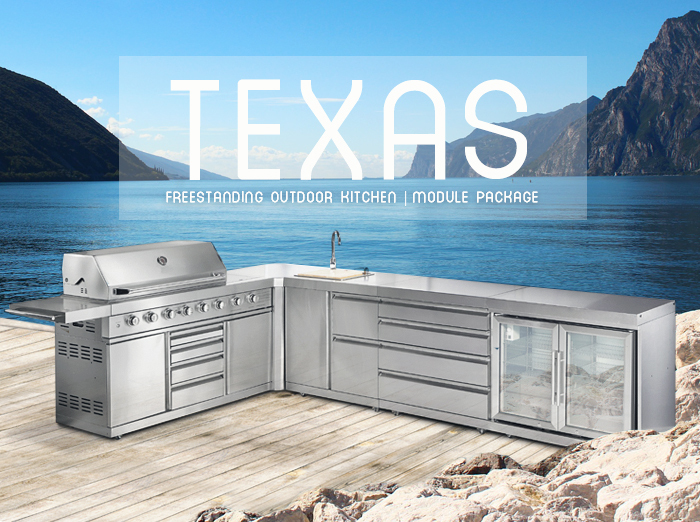 Purchase a complete module package for a package price to get a state-of-the-art kitchen with everything you could possibly need for outdoor cooking and that will draw admiring looks from everyone! 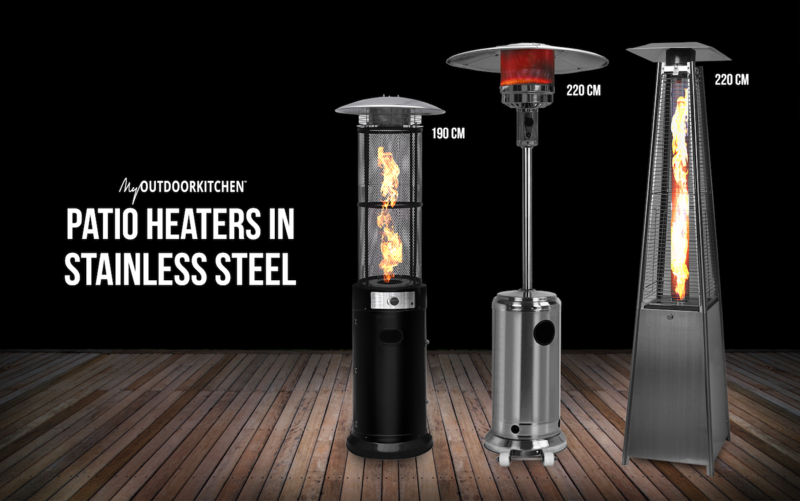 Extend the outdoor season with an elegant patio heater from Myoutdoorktichen in 100 % stainless steel (304 SS). High output, safety valve and burner for safe use. 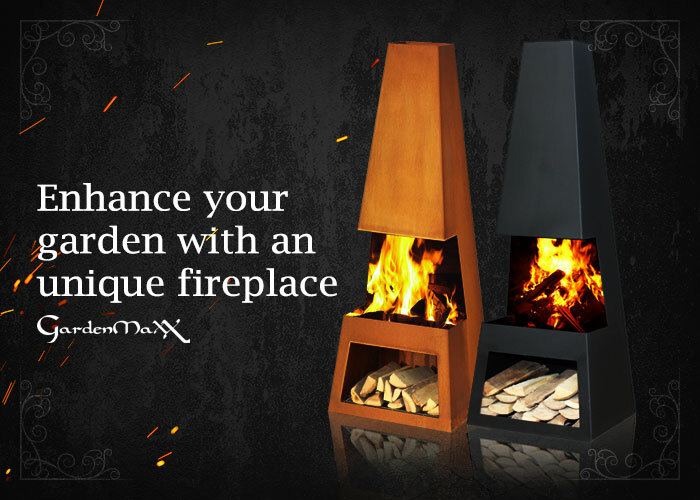 Choose Myoutdoorkitchen’s heater for a unique experience! A fireplace is the ideal companion for your outdoor kitchen. GardenMaxX offers you everything and more with its practical storage options, contemporary designs and durable material: corten steel. Find your favourite in GardenMaxX’s extensive range and enjoy spending your evenings out of doors all year round! 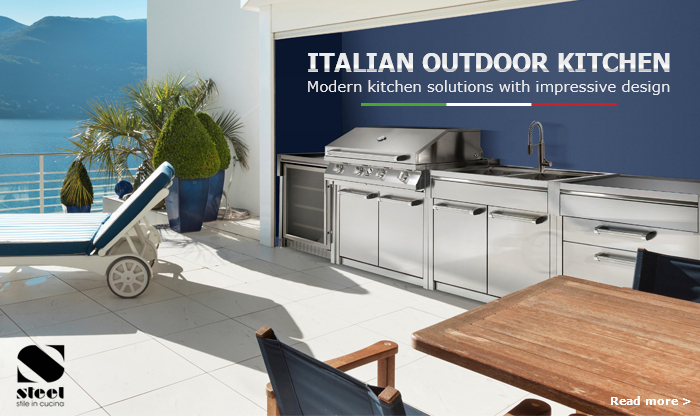 With many years of experience on the world market, the Italian brand Steel is a leading player in the outdoor kitchen industry. Each product is unique and specially customized according to your wishes and needs. With a wide selection of products from Steel you are guaranteed to find an outdoor kitchen that suits your home! 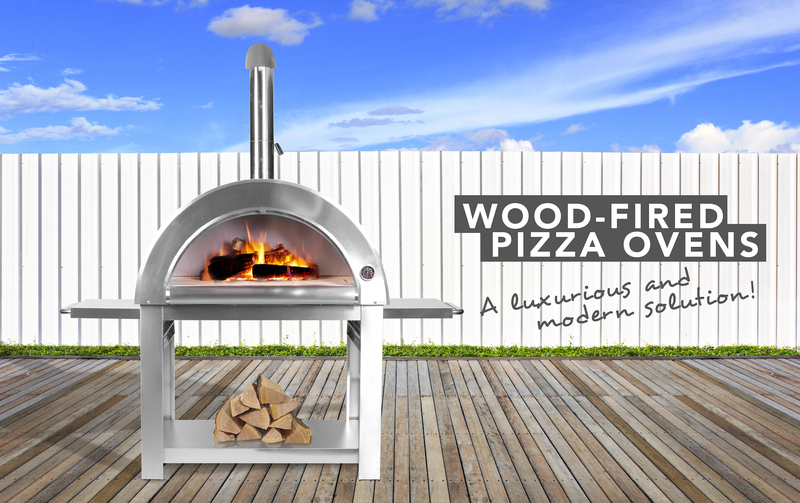 Now you can have your own classic firewood baked pizza prepared in a modern way. Our pizza ovens are unique and made of 100% stainless steel. 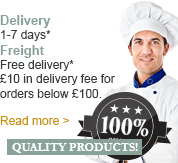 We provide pizza ovens in various sizes and designs - something for different occasions and every home! Take your grilling to a whole new level with a Kamado. With its unique designs and features, you can use it as a grill, a smoker or even a slow-cooker. Integrate it with the rest of your outdoor kitchen in a consistent and stylish way or use it as a freestanding unit. 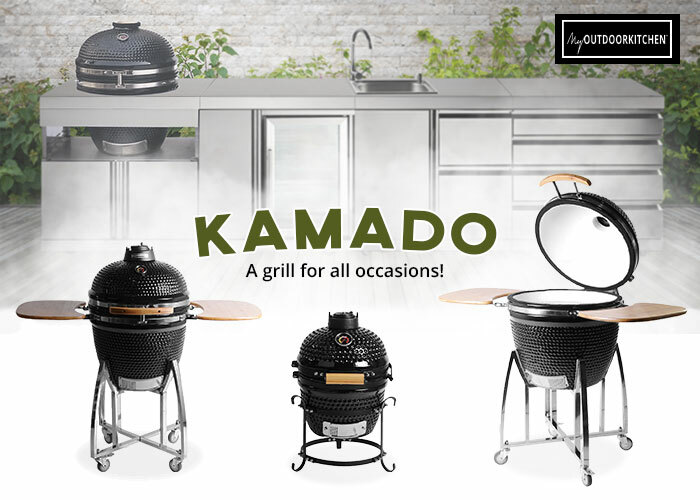 Kamado, a grill for all occasions! Uniform freestanding outdoor kitchens in a stainless finish from myoutdoorkitchen. We have packages suitable for everyone; choose from different combinations of sizes and shapes to find the one that suits you best. The module can be placed in the environment of your choice, to create an incredibly cosy oasis. Make the cooking process much more fun. Treat yourself to an outdoor kitchen of the best quality! 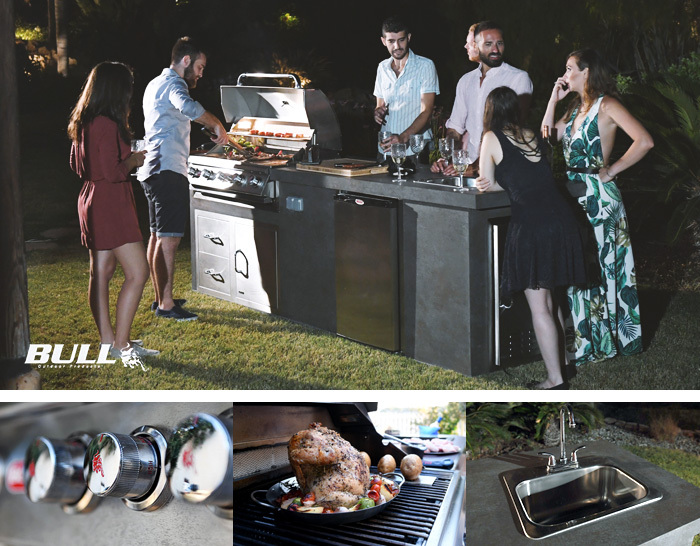 BULL is an American company that manufactures superior-quality outdoor kitchens, designed to meet all market requirements and standards. Bull’s outdoor kitchens are CSA and CE certified and come with a lifetime warranty! There’s a choice of three unique outdoor kitchens in a range of materials and sizes, or you may even want to design your own? Bull offers a variety of colour and material options to choose from to suit your wants and needs. Please contact our customer service team for more information - let us help you design your American dream kitchen! Lindström & Sondén AB is an e-commerce company and distribution agent which started in 2004. Today we have several agencies and run a number of e-commerce sites.